For an easy reading experience, click titles below to jump to respective sections of this article. 1. What is a Hydraulic Cylinder? 2. How Does a Hydraulic Cylinder Work? 3. What Are the Main Types of Hydraulic Cylinders? 9. What Are They Components Of A Hydraulic Cylinder? 10. What Characteristics Distinguish the Different Cylinders? 12. How to Maintain Your Hydraulic Cylinders? 13. How To Store Hydraulic Cylinder Parts? 14. What liquid is used in Hydraulic Cylinders? 15. What are Some Common Hydraulic Cylinder Terminologies? A hydraulic cylinder is a device used in situations where substantial force is needed to move a load. For example, it could be against gravity, where a heavy load needs to be moved upwards. Cylinders can be used in a wide range of tasks including civil engineering, mechanical engineering, automotive, aerospace and construction. 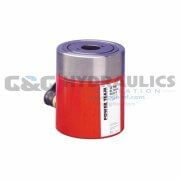 Large, small and miniature hydraulic cylinders are for sold on the market today. Liquids are virtually incompressible while gases are very compressible. Liquids are almost as incompressible as solids but have the ability to flow like gases. This makes them easy to transfer force without making them compress. This is a similar principle that is used in many applications including car brakes, where you use your foot to produce a small force on the brake pedal, but that results in a large force, enough to make the car wheels stop turning. Basically, there are two types of hydraulic cylinders: single acting and double acting. Furthermore, these can be classified in more detail depending on the design, purpose, and method of manufacturing. Single acting hydraulic cylinders are used to move a load in one direction. Single acting hydraulic cylinders can only move loads in one direction because the hydraulic fluid is fed from only one end of the cylinder. Once the fluid goes back into the reservoir, the piston will need to be moved back into its original position, which is called the retracted position. This can be done using a spring or by an external load. 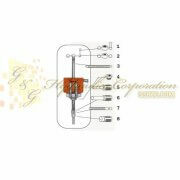 This system makes use of a spring that is installed within the system. As the piston moves to push the load, it first compresses a spring before coming in contact with the load. Once the load has been moved and the fluid is returned into the reservoir, the spring relaxes and as a result pushes the piston back into the retracted position. This type of cylinder is suitable in cases where the piston has to return immediately after the load is lifted. Load return hydraulic cylinders utilize the force provided by the load itself to retract the piston into the retracted position. Any external force can also be used to achieve this result. Usually, the force needed to retract the piston has to be more than 20% of the cylinder's nominal push value. This system is ideal when it is not necessary that the piston moves back into its initial position quickly. Low Moving Force: The piston usually needs much less force to move since the entire system is lighter than that of a double acting cylinder. Less Length: Single acting cylinders can be smaller than the double acting type and can be installed in tighter spaces. Small Force of the Return Movement: While the piston still has to be returned, this is done without expending any unnecessary power unless the return mechanism uses another hydraulic system. However, for the spring and load return types there is a less energy expended on returning the piston. A double acting cylinder is an actuating device with the ability to move loads in two opposite directions. That’s because unlike the single acting type, it has hydraulic fluid feeders on both ends of the cylinder body. The double acting cylinder needs a special method to connect the rod to the load. It needs a hole for the piston rod to extend out of, but this then means the fluid might escape. The system, therefore, needs a gland or ‘stuffing box’ to prevent the hydraulic fluid from leaking. If there is no external force to retract the piston, a double acting cylinder might be necessary. It is also handy whenever a large force is needed to return the piston to its home position, or where there are loads to overcome in both directions. Differential Double Acting Cylinders have a rod only on one side of the piston. This makes one side of the piston more effective than the other since the volumes of the fluids that can go in on the two sides of the cylinder body will be different. This means the push force will be more than the pull force. This also means the velocities at which the pistons travels when being pushed and pulled will vary. Synchronous Hydraulic Cylinders have rods on both ends of the piston and this makes the volumes of fluid equal on both sides of the piston. These are useful if you need the velocity and force of the piston to be the same whether it is going in or out. Hydraulic cylinders also differ in the way they are constructed, especially in the mode of attaching end caps to the cylinder barrel. There are also variations in material types and cap wall thicknesses. The two most popular methods of construction are tie-rod and welded rod. This type of hydraulic cylinder makes use of steel rods that come with threads, so they can be fixed using nuts. The number of steel tie rods used depends on the bore diameter. The larger the bore, the more rods will be necessary. The biggest advantage of using this type of construction is the ease with which the system can be dismantled. For this reason, this is the most widely used method for many industrial applications. This is a more permanent type of construction and as such, inspections and repairs can be close to impossible. The end caps are simply welded to both ends of the barrel. Firstly, end flanges are fixed to the barrel and finally the caps are fixed to the flanges. The advantage of this system lies in the minimal weight and compactness it comes with. 1. How Do Single And Double Acting Cylinders Compare In Terms Of Availability? Double acting cylinders are more readily available than the single-acting type. That's because they can be used in many more applications. Even though double acting cylinders can be converted into single acting ones, the fact still remains that they are double. 2. Which One Has a Higher Rate of Jamming? Single acting cylinders rarely get stuck if they are really well-designed, but that's not to say they don't. They can sometimes get stuck when trying to retract the piston, and this can take some effort to push back. For double acting hydraulic cylinders, however, there isn't any problem of the piston getting stuck since the system can push loads in both directions. 3. Which One Needs More Space For a Reservoir Between Double Acting and Single Acting Hydraulic Cylinders? A single acting cylinder pushes the piston up when the fluid is pumped into the cylinder. However, it all has to be expelled back into the tank once the piston is retracted. On the other hand, a double acting cylinder will take the hydraulic fluid in, but on expulsion, the fluid will be directed into the other end of the piston since it has to be powered both ways. This means a double acting cylinder can work with just a small reservoir since most of the times the fluid will be in the cylinder. 4. Which is the More Versatile Between a Single Acting and a Double Acting Cylinder? A single acting unit is useful where you only need to lift something and know that its own weight on the cylinder is sufficient to bring it down again. The single acting option is usually workable where gravity is available, and that is usually in vertical or near vertical orientations. In most situations, the double acting system is the best choice. It can work in multiple applications like steering systems, digging equipment and any systems that need turning components. 5. Between a Single Acting and A Double Acting Cylinder, Which is Prone to More Corrosion? Single acting cylinders need to have a kind of breather on the piston rod end. Since the piston rod never has any lubrication, any moisture that gets into the system will put it at a risk of corrosion. This risk extends to any parts inside that do not have chrome plating. If the system is used regularly, this poses no threats at all. However, if it happens to be idle in, say, the winter, there will definitely be a risk for rust to form, which will make the system less efficient. A double acting system, on the other hand, will have the entire length of the cylinder lubricated and there will be no room for moisture to get in, making it less susceptible to corrosion. The double acting hydraulic cylinder is more involving to build and as such will cost more. You will also need to buy more hoses than you would for a single acting cylinder. In terms of energy, there is more usage by the double acting cylinder, unless the single acting system is using another external hydraulic system to retract the piston. But, where gravity is used, the only power expended is when the piston moves to push a load. Locking Collar Cylinders: Hydraulic cylinders might not be ideal to hold a load for prolonged periods of time by fluid pressure alone and this is where a locking collar cylinder comes in. The plunger comes with a locking collar, which is basically a nut and this is used to hold loads in place for prolonged lengths of time without punishing the hydraulic system. After the rod is pushed out of the cylinder, it is can be held in position using a nut that can be screwed down the threads of the rod, securely holding the load mechanically. Center Hole Cylinders: While hydraulic cylinders can perform general tasks like overcoming gravity to lift a load, or providing horizontal force to move a load, center hole cylinders can be used to generate tension in cables, wires, ropes, or chains. High Tonnage Cylinders: High tonnage cylinders are good for different tasks. They can be used to move and set heavy offshore modules, construct bridges, and to build and assemble ship sections. 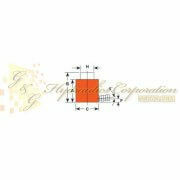 They are also used in the construction of bridges and leveling homes. Low Profile Cylinders: This is a small hydraulic cylinder type used to move loads in situations where there is low clearance. They come in three types. 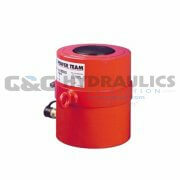 The first comes with the same shape as an ordinary hydraulic cylinder but with a shorter length. These are simply referred to as ‘low profile’. The second one is ovular and is called a flat jack. The third comes with the ordinary shape only with a large radius thus the name pancake jack. 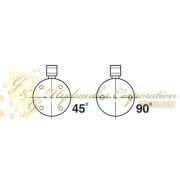 The last two, the pancake and flat jacks, can have really low profiles in the range of 1.3 inches. Pulling Cylinders: Pulling cylinders, which are also called pulling jacks, are designed to pull heavy components together, to stretch steel cables that support musts and bridges, and electricity wires with high voltage. They can also be used in scale systems used to weigh heavy items. 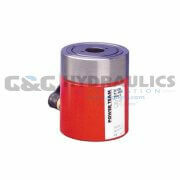 Plunger Cylinders: The best example of this type of cylinder is the one used in car service and repair center. They are always placed upright and are designed to overcome gravity. To return the piston to its retracted position, the same load being worked on is used once the fluid supply is cut off. Telescoping Cylinders: Because they are built with tubular rods with varying diameters that are fitted into each other, telescopic cylinders come with long strokes. 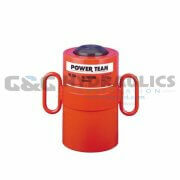 They are therefore suited for use in machinery like cranes and loaders. They can either be single or double acting depending on the application. Cable Cylinders: These have the advantage of being usage even when you are faced with little space. They are built as double acting and with their long strokes are capable of producing decent force. Diaphragm Cylinders: The most distinguishable characteristic of diaphragm cylinders is that they are sealed and do not leak fluid around the piston area. They come in two forms; flat and roller diaphragm. The main parts of a hydraulic cylinder include the bottom, the bottom connection, barrel, and head. Other important parts are the piston, the piston rod, and to link the two, the piston rod connection. 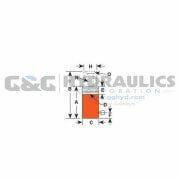 In some types of hydraulic cylinders, special components called feet may be found. The purpose of these is to mount barrels. The barrel is basically a tube with thick walls of high performance material. It comes with an interior that is either ground or honed, or both. To connect the barrel and the cylinder bottom, most manufactures use the welding method. This attachment method has the disadvantage of putting the cylinder at risk of damage due to the welding. The alternative is to bolt the components together. By so doing, the cylinder becomes much easier to repair. The profile of a cylinder refers to its height when it’s in the retracted position. There are both standard and low profiles on the market. The low profile type is applied in situations where there is low clearance. As such, these come with a short stroke. The other distinguishing characteristic of hydraulic cylinders is the number of cycles the cylinder can go through before requiring maintenance. For those considered high performance, about 2500 cycles can be achieved without maintenance. The materials used in these are resilient and hardy. Different cylinder components use different materials. Chrome alloy steel is used for the body while the plunger is made of chrome plated steel. For its lightweight, aluminum is the preferred material although this is limited to light duty cycles only. The material is also resistant to corrosion and offers little spark hazard. To choose the best cylinder for whatever task you might be faced with, make sure you answer all of the following questions. 1. Does the task need pulling or pushing (or lifting), or both? If you only need the load to be moved in one direction, a single acting cylinder will suffice. 2. How much room do you have to operate your cylinder? If there is little space between the load to be moved and whatever reference surface you will be using (floor, wall, etc. 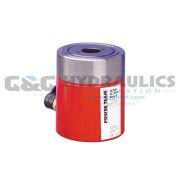 ), you may have to go for a low profile or even a flat hydraulic cylinder. If you have ample room, a standard cylinder will do. 3. To find out what stroke will be sufficient, ask yourself what length you need to move the load for. 4. How long will the load need to be supported after being acted on? For loads that need extended action by the cylinder, you may have to go for a locking collar cylinder. This will hold the load in position without punishing the hydraulic system. 6. Will there be need to insert any objects through the center of the cylinder? If so, then a center hole hydraulic cylinder is the best option. 7. How many cycles will be necessary? If you need less than 2500 cycles before thinking of repairing the cylinder, then an ordinary system will suffice. For anything more than 2500 cycles, go for a heavy duty type. 8. The other important question to ask is how much force you will need to overcome. Check for a cylinder with a capacity high enough to handle the load. A cylinder piston rod can bend due to 3 main reasons. It can bend if the rod diameter is not sufficient, if the material used is not strong enough, or if the mounting method is not correct. Sometimes, the cause can be a combination of all three reasons. A bent rod leads to further damage since it applies excessive pressure on the rod seal, resulting in the seal failing prematurely. Always perform checks for rod straightness as you repair your hydraulic cylinder. To see if the rod is straight, put it on rollers then use a dial gauge to measure it. There should be maximum straightness although an allowance of 0.02 inches per 3.3 feet of the rod is okay. If you have a bent rod in your hydraulic system, measure the actual load placed on the system against the permissible load depending on the mounting method used and the strength of the material. If the actual load happens to be more than the permitted load, then it would be in order to replace it with a newly manufactured rod that has the appropriate qualities to meet the load demands. If the walls of the cylinder are not thick enough or the materials are not of the correct strength, the cylinder tubes may balloon up in certain points. When this happens, the required tolerance separating the piston seal and the wall will be upset. This will cause any pressurized hydraulic fluid to seep between the spaces, and since the fluid passes at high speeds, it will result in seal erosion. Furthermore, the drop in pressure results in local heating over the piston and this further reduces seal life. The best way to check if a piston seal is still sound in the double acting type of hydraulic cylinder is by applying pressure then measuring any leaks past the piston seal. However, this does not tell you anything about a ballooned cylinder resulting from stress due to insufficient wall thickness. To check if the cylinder wall has indeed ballooned, the best method is by using piston-seal bypass test mid stroke. If the torsional force far exceeds the gland's and piston's bearing area's ability to handle the load exerted on the cylinder, the rod and piston seals are subjected to excessive pressure. This causes the seals to deform and at last, fail. The texture of the cylinder rod surface can have a far-reaching impact on the lifespan of the rod seals. It is important that the rod has just the right roughness. If it's too smooth, there will be insufficient lubrication which will lead to the reduction in the seal's life span. But, if it's too rough, it will result in too much fluid leakage. Since hydraulic components are expensive, it is important that you store your collection in a manner that ensures their long life. Here are some things you can do to makes sure your hydraulic parts are not subjected to damage during storage. Store them indoors: This can be hard to achieve for bigger hydraulic systems but if it is at all possible, store your hydraulic parts indoors, in dry areas free from dust. Protect metal parts: Make sure any exposed metal seals are covered with grease and/or protective oils or films. Chrome rods should be covered using tape soaked in oil but make sure the piston is completely in its return position. If there is more room for retraction, the tape wrapped around the rods will damage the seals as the piston rod slides in. Protect all ports: Seal all the port connections of your hydraulic components with steel plugs. It is possible to use materials like plastic but these can easily move out of place. Store at room temperature: Storing at proper temperature insure optimum seal integrity and preventer unnecessary internal and external wear. There are different liquids used in hydraulic cylinders. Among them are mineral oil, silicone and water based fluids. The liquid used is called hydraulic fluid. There is much more to hydraulic fluids than just having the ability to flow and be incompressible under pressure. Therefore, not just any liquid will make the grade as a cylinder fluid. 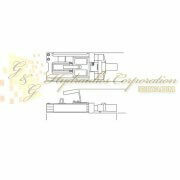 Consult G&G Hydraulics Corporation (www.gghyd.com) for the proper fluid needed for your application. Viscosity: A hydraulic fluid must have just the right viscosity and this is one of the most important characteristics. Viscosity simply means the ability of a liquid to flow. For example, tar hasa low viscosity while gasoline has a high viscosity. The higher the viscosity, them more fluid the liquid is. Hydraulic systems depend on valves and seals such to work effectively. This means that a fluid that is too thin will easily leak through these components. Furthermore, a suitable hydraulic liquid should provide some lubrication between the moving parts but if it’s too thin, it won’t form a film thick enough to prevent friction. However, the fluid should also not be overly thick as this brings undue resistance in the system which will lead to more energy being expended. Low Acidity: As the fluid deteriorates with usage, it should not turn acidic as this will corrode the metal in the components. Beyond that, there is a risk of moisture condensing within the system during a long idle time after usage. This may lead to rusting components and for this reason, the right fluid should also be able to protect the components from rust. To achieve this, there are some liquids that can be added to hydraulic fluids. These, however, can only work for specified periods of time and therefore it is important that you monitor the fluid to make sure it does not get any contaminants and is used only for the specified times. Resistance to burn: Hydraulic fluids have two properties that pertain to burning. One is the flashpoint, where a liquid becomes too hot that it evaporates and instantly burns at once when exposed to a flame or spark; and fire point, where it becomes so hot that it evaporates and ignites and continues to burn slowly when exposed to a flame. The right fluid must have a high flash point and flame point. Low Toxicity: The ideal fluid should have minimal toxicity, that is it should not contain any poisons that may harm operators either through vapors inhalation, contact with the skin, or accidental ingestion. Most manufacturers strive to keep the fluids non-toxic. However, some additives meant to increase fire resistance can be poisonous. It’s important to handle these with the right gear and sufficient precaution. Low foam: Foam results from gas bubbles within a liquid. In hydraulic systems, it is formed when a liquid under high pressure with a substantial volume of gases is finally relieved, for example when it goes back into the reservoir. This results in an emulsification which causes the liquid to lose some of the characteristics necessary for a perfect hydraulic system. They become compressible, have their viscosity altered, and become less lubricating. 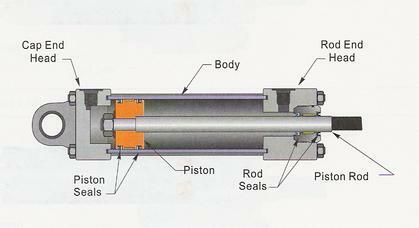 Hydraulic Piston Rod: This is the part of the hydraulic cylinder that moves in and out of the cylinder body. It is also called a plunger or ram. Stroke: The stroke of a hydraulic cylinder is simply the difference in plunger length when it's extended and retracted. It is a measure of how far the ram can go. Oil Flow: Also called the flow rate, is the amount of hydraulic fluid that can be transmitted to the cylinder by the pump. A high oil flow means the piston will move faster. Collapsed Height: The collapsed height of a cylinder is the height of the entire hydraulic system from base to the tip of the ram when it is fully retracted. Extended Height: This refers to the height of the entire hydraulic cylinder from base to top when the ram is fully extended. Cylinder Effective Area: This refers to the surface area of the ram that gets into contact with the load. Oil Capacity: Refers to the amount of oil that the tank or the cylinder can hold. In both practice and theory, the oil capacity of the tank must be higher than that of the cylinder to allow the piston to go as high as possible. When considering oil capacities, hoses should also be taken into account since some fluid remains in them. Low-cycle Hydraulic Cylinder: These are hydraulic cylinders that do not go through frequent retraction and extension. For example, construction hydraulic cylinders are low-cycle. High-cycle hydraulic cylinders: These hydraulic cylinders go through rapid retraction and extension. They are built with rugged material to withstand the demands of the tasks they handle. They are found in production machinery. 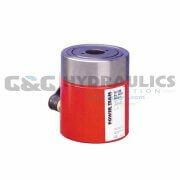 Single Acting Cylinder: Refers to a hydraulic cylinder that only pumps oil one way. The piston therefore only moves in one direction. Double Acting: In double acting cylinders, the fluid is pumped in both directions. This allows the piston to move loads in two opposite directions. Wherever there is a piece of heavy equipment, somewhere in there should be a cylinder, and the hydraulic option is often the most practical. 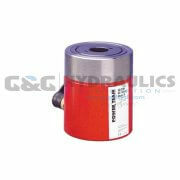 They are the actuator or mover in a hydraulic system. To make sure you don’t go running around town when your expensive machinery is sitting idle, we have looked at pretty much all applications and provided the right hydraulic cylinder for it. You will find our wide selection of hydraulic cylinders pretty exhaustive, whether your application involves pulling, lifting, lowering, or pushing something. RD8013 SPX Power Team Cylinder, 80 Ton, Push/Pull Double Acting, 13-1/8" Stroke UPC #6625360029..
RD5518 SPX Power Team Cylinder, 55 Ton, Push/Pull Double Acting, 18- 1/8" Stroke UPC #662536385..
RD5513 SPX Power Team Cylinder, 55 Ton, Push/Pull Double Acting, 13-1/8" Stroke UPC #6625360028..
RD2514 SPX Power Team Push/Pull Double Acting Cylinder, 25 Ton, 14-1/4" Stroke UPC #66253600281..
RD2006 SPX Power Team Cylinder, 200 Ton, Push/Pull Double Acting, 6-5/8" Stroke UPC #6625360028..
RD20018 SPX Power Team Cylinder, 200 Ton, Push/Pull Double Acting, 18-1/8" Stroke UPC #66253640..
RD20013 SPX Power Team Cylinder, 200 Ton, Push/Pull Double Acting, 13-1/8" Stroke UPC #66253600..
RD1506 SPX Power Team Cylinder, 150 Ton, Push/Pull Double Acting, 6-5/8" Stroke UPC #6625360027..
RD15018 SPX Power Team Cylinder, 150 Ton, Push/Pull Double Acting, 18-1/8" Stroke UPC #66253638..